I am writing this in a hotel on the Road to Damascus. The actual road, which is called – wait for it, I am not joking – Damascus Road. I am on the “Frontiere Syrienne” and the town of Damascus is only ten minutes drive away. I feel though I will have a Damascene moment… any moment. I am here to taste some Lebanese wine. Don’t the customs people give a good indication to a new country? If I ran a country I would put the customs staff on PR training. And taxi drivers, particularly those who hang out at the airport. Luckily we have a very nice chap called Tony who will drive us around and will be able to help me with my very (very) basic Arabic. The customs officials have been amusing, if not flirtatious. I was asked twice if I also had a Lebanese passport, which is the nicest welcome I have had in a while. Apart from holding up the group who were waiting patiently at the baggage claim, I was delighted. When we entered the hotel in the Bekaa Valley, they had a Christmas tree up and decorated. We are in the land of the cedars. The flag is a Christmas tree, why would you not want to decorate it in beautiful baubles. Apart from the cypress in Italy, the Lebanese cedar is one of my all-time favourite trees so I am happy to see it dressed up. The country is 3.8 million people – not including the hundreds of thousands of Syrian refugees in the south who take it up a notch. The lights have gone out a few times tonight in the hotel. On the plane, there was a section on the in-flight magazine called “Business Opportunities” – about the lack of free water and water systems. This is something I would like to talk to the wineries about… I have not even set foot in a vineyard and there is plenty of talk about how the environment here is under stress. 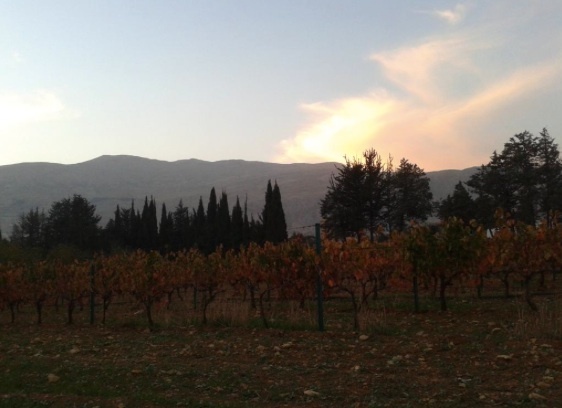 Talking to Michael Karim, an expat who returns to Lebanon as unofficial ambassador for wine – the landscape has changed. The beauty remains in the people. Lebanon must have one of the biggest and most brilliant expatriate communities for such a small country (recently in the spotlight, the woman who married the actor George Clooney, human rights lawyer – Amal Alamuddin). And then there are the flavours, which is what I am here for. Tonight we had a simple mezze in the hotel instead of going out for dinner. Andrew Neather wanted to try wines that we were not going to see on this trip tonight, so we found Hochar 2007 Chateau Musar, Chateau Khoury 2006 hidden in the bar (not on the menu). Platters of tabbouleh with mint, beef kebabs, brilliant hoummous and baba ganoush with mint and pomegranate. Growing up in Australia, I did not realise tabbouleh or labne were particularly Lebanese it was so much part of my life. Now I am at the source and it is somehow like finding a long lost relative. The dinner revolved around the get-to-know-you gossip. Have you met so and so new girlfriend? Did you go the Gigondas masterclass the other day and hear the argument? (I didn’t but went to the brilliant dinner afterwards of 20 year retrospective of the region, which I will write up – stay tuned, it was rather incredible). You are selling a dream, woman! Its all a soul needs on a cold November night. Thank you so much.